Recorded: Live at Yoyogi Taiikukan Hall, Tokyo Japan May 11th. 1985. Comments: This show was pro-filmed, and a video & laser disc was released officially in Japan ONLY. Later on a dvd was released to, but again in Japan only. A radio broadcast was also done in Japan. The source used on this 2cdr, comes from a mix between the laser disc & the radio broadcast. There was a few songs different between the laser disc & radio broadcast. Roots: As mention over, but might been from other released bootlegs as well. 1: Is This The World We Created? Comments from Gigi's web page. 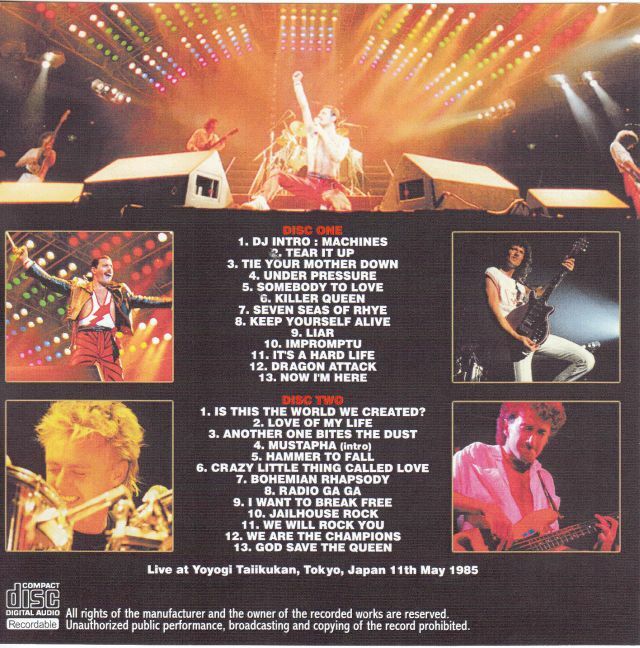 From Japan last tour with 1985 in ” The Works ” , in the Tokyo Day 3 official live video was also released , live performance in Tokyo , at the National Yoyogi Stadium in May 11 at the end of taking Queen at the time, as ” Weekend Live Special The Concert ” , I have recorded in ultra-high quality stereo sound board recording of the strongest , best take was broadcast by certain government-run radio station , the . Are digitized directly from the air check tape mania during had been recorded and stored , outstanding stability of the sound quality . You who thought ” But That's are at the official ,” said it large mistake . Wow, this radio broadcast version , mix of sound is the difference the official video version . 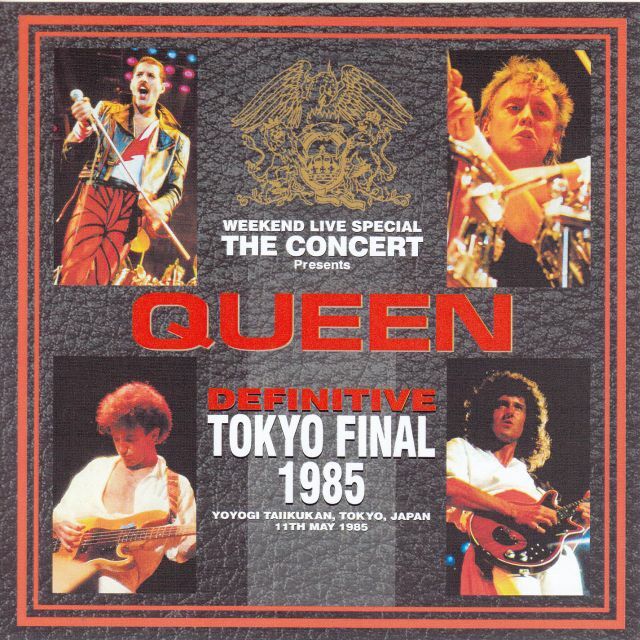 While also impressed that it was officially released Tokyo final performance is imaged , or uncomfortable to the keyboard sound that is mixed in slightly bigger guitar or more , people at the time , saw the video was too build strangely , to sound poor to live feeling , and I think in was carrying the thought that somehow indecisive . I think the person who was seen actually live in particular , and that the contour texture image of a sound very different from the sound out , I felt embarrassed even if you are watching . In contrast, the radio sound source . Whole picture of the show has been recorded almost completely sound with excellent fruit that does not feel such a drawback . In fact , a famous mania among overseas , this radio sound source , I have gained a high reputation ” or more officially , is excellent as a live document of the day ” and ” choice of the day .” In fact , it is not subjected to exaggerated so mix , the tape that table recording , giving the appearance of a recording of an actual performance to the extent that it is not too much , it seemed to me to radio broadcasting as Fururaivu most minute not a crowded build strange , sound balance natural straightforward indeed , is the reason that enjoy the full picture of the show ( drums Roger was a strange sound and the official is also natural . ) . So say , the radio sound is really great ! Normally , in the near future , as best live take of 1985 ‘s trees , excellent sound enough press seems to CD is desirable . Even better , I have been non-cut recorded in perfect sound in this take is Dragon Attack the Liar, was cut Marumaru even that was recorded first part is edited in the official video ! Japanese MC is due to Rock DJ on behalf of Japan , but ( of course , it is not wearing the song ) beginning , Encore before , but because it only by being covered with a narrative short simple , including a song introduced to end , national Broadcasting therefore , there is no CM to shut off the flow , so that you can listen Kiru stereo sound board of the highest level of the whole picture at once live . Of course , it has been applied a process of compensation of fine cuts and sound pressure adjustment on our side as well , including the current stage , this take is , you will be declared to be the best version of 1985 ‘s trees performances . Also replace the official voice only Machine of intro DJ referral suffer If it goes that way , if I tie some cheer to the main radio source , and make it a mix of some official voice , the best version further also possible … · . Excellent recording of an actual performance of ’29 before such a dream also spread ! First tonight , Please fully enjoy , the radio broadcast of the best take . That’s awesome! ! !